Pain Level: 1 - Got weird electrocutey feelings in my chin and lip (where it's currently numb) on my walk out to the supermarket today. Other than that, nothing much bothered me today. Swelling: I've pretty much given up on keeping track now. Sleep last night: Was okay. I think I got about 6 hours. Weird dreams. Other weirdness: Pee tonight was a neon yellow today. I think it's because I've added a Vitamin B supplement to my diet. #0_o# Rash below nose still there. One little rash seems to have developed into a bump. I've recently become very disinterested in work issues and a lot more interested in the activities that I feel are more important in my life. It's hard to put a finger on it, but I think I've just become very much jaded by all that has been going on around me - dealing with legal issues, trying to figure people out, considering business options.... is this the life I want to live? Today my mind just focused on what was a serious, but perhaps silly question, "Is it possible to grow taller at this age?" I've been researching a couple of different options - including this weird, but seemingly very wide-spread one called "Grow Taller for Idiots", and there's another one which works with a pill and stretches. I'm a little skeptical, so I'm going to hold on to the purchases for a while and talk to one of my aunts. My aunt actually did visit a doctor who prescribed her sons with some growth hormone pills and now they are REALLY tall. I'll be meeting up with her on Thursday to ask her about it... I figure that if there is something out there that works, even if it's just exercise and proper sleeping patterns, I might just give it a go. If I'm serious about exploring modeling, I need to break into the 5'4 or more. I know it sounds ridiculous, but I suppose it is a good thing that there is a certain level of commitment and passion to getting to this goal of mine. If it works, it might just open new doors for me. Maybe. But at least I try. I'll have to get back on track tomorrow. A lot of people are depending on me. I also need to start thinking about the future (beyond all the whirlwind of stuff at work) soon. In the meantime, I've keeping myself well occupied with research and writing... and thinking of new syringe-friendly foods so that I will keep myself satiated as I can feel my body starting to craving to chew on things again. 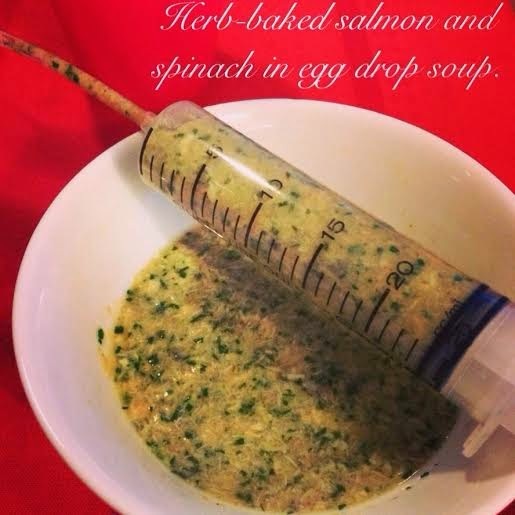 I've been encouraged by a friend that I should really be posting up my photos and recipes of my plethora of syringe-friendly foods... Maybe I'll do a food, or "food", post soon. :) Gotta watch my weight though... I still have about 8 kilos to lose to get to my target weight. spinach in egg drop soup. it was... and that I had VEGETABLES! I think getting some outside-work work done. Not getting much real work done.